Now is the time of year to get the bulb catalogues out and start to think about the spring display. 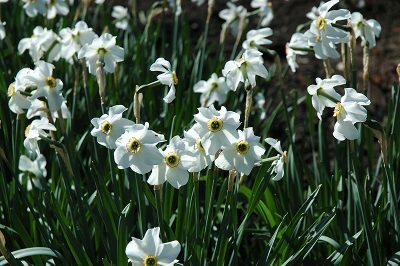 Bulbs look great in pots and flower beds, but they come into their own when planted on mass. 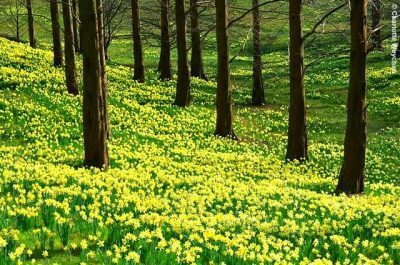 Sweeps of bulbs along a winding drive, clumps in long grass under fruit trees, or lining the bottom of a hedge, naturalising bulbs make their impact. Here is a selection of good naturalising bulbs, that will bulk up and increase in number, from late January to April. 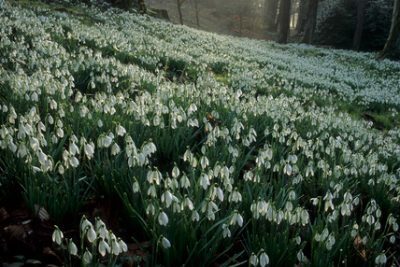 Galanthus nivalis: The native snowdrop. 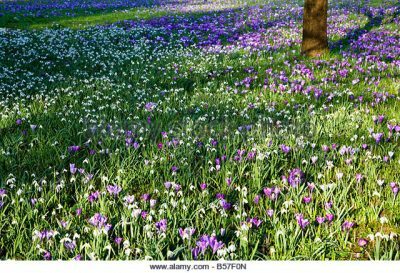 Plant in sparser grassy areas so they do not get over come, or in woodland margins Plant in groups, well spaced to allow for the bulbs to bulk up. Flowering mid- January to mid-February. 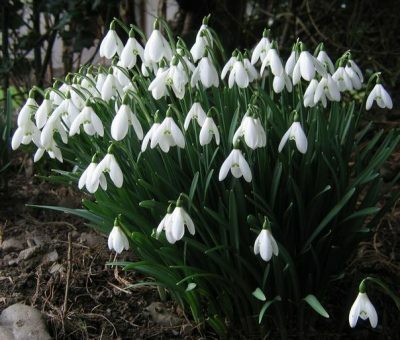 G. ‘Atkinsii’: taller plants with larger white flowers and green tip markings, than the common snowdrop. Again a good nationalising bulb, plant as above . Flowers January to February. Crocus ancyrensis ‘ Golden Bunch’: early Dutch crocus, plant in short grass in clumps, in sunny areas. Thin dirk green leaves with central sliver stripe. Egg yolk yellow bowl shaped flowers that when the sun is shinning, open flat to show orange stamens. Flowering February to March. 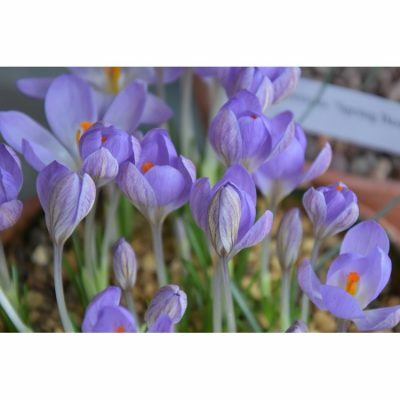 C. etrusus ‘Zwanenburg’: again an early Dutch crocus, plant as above. Wider leaves with a more pronounced sliver stripe. Soft mauve flowers with lower grey/white base, again stunning when the sun is shinning and they open up fully. Both these crocus bulk up well, as long as the mice do not get feeding. My top tip, would be to plant them on a south facing bank, where they can really be seen at their best in the early spring. 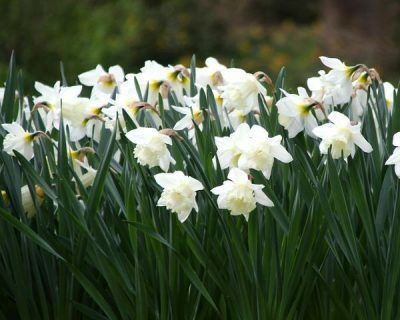 Narcissi ‘Mount Hood’: A good naturalising mid season Daffodil. With white/cream trumpet and white slightly refluxing petals, at 35-40cm tall. Plant in dense sweeps or irregular clumps to give a natural look. Allow room for the bulbs to increase. Flowering late March to mid- April. N.poeticus recurvus: The old fashioned and much loved ‘Pheasant eye’ Narcissus. This late flowering bulb looks wonderful planted in an orchard in great sweeps under fruit trees which will have blossom at the same time. Tall at 40-45cm. An open flower of flat white almost papery petals and a small shallow orange red tinged central cup and low soft yellow stamens, with a delicate scent. Flowering mid April into early May. 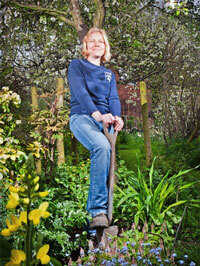 Sweeps of on mass planting of snowdrops and crocus. All these bulbs do best in a sunny spot,apart from the snowdrops that can cope with the woodland edge. So get ordering your bulbs now for October/ November planting. Follow carefully the bulb nurseries planting instructions, particularly about bulb planting depths. Most people tent to plant their bulbs to close to the surface, in shallow scoops particularity when planting in grassland. Always wait till there has been a good quantity of autumn rain to help soften the ground up first. Also if you are planting a lot, which you will have to do if you want sweeps of natural looking bulbs, it will be in the hundreds, a bulb trowel or bulb planter will be invaluable. So get cracking now for a wondrous bulb displays next spring. This entry was posted in Gardening Thoughts, Gardening Tips and tagged Bulbs on September 10, 2018 by Emily.